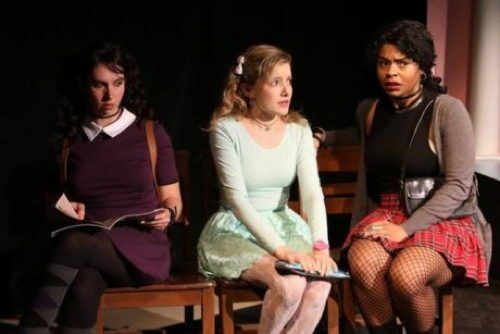 Chara Bauer as Patty, Emily Sucher as Jeanine, and Tatiana Nya Ford as Renee. Photo by Shealyn Jae Photography. Cohesion Theatre welcomes you to a slightly off, slightly alternative world where the “in-crowd is the thin-crowd.” My high school days flood my mind, and I can’t help but cringe at the number of times I watched my friends binge and purge like it was the answer to all teenage troubles. It isn’t; and the dark, dark comedy “Schoolgirl Figure,” directed by Jonas David Grey, drills home the seriousness of such eating disorders. …it was very easy for me to laugh through the whole production. Grey states in his director notes that they are “not offering an issues play” but a social commentary about how far people will go to get what they want. The characters do go to extremes in some pretty outlandish ways, but he says he isn’t making light of these serious issues, and I believe him. In the end, “Schoolgirl” is a comedy, and it was very easy for me to laugh through the whole production. The play opens to two friends, Renee (Tatianan Nya Ford) and Patty (Chara Bauer) waiting in line for the bathroom for Patty to purge her lunch. There is a wait because the other girls are in the stalls already purging. As Patty and Renee discuss what is wrong with their bingeing technique (Patty’s is the best), their conversation turns to their “friend” Monique (Jane Jongward). Monique is a death’s door and to Renee and Patty, Monique is the queen of the Carpenters, because she is an “uber-anorexic,” and dying from anorexia is the best way to go. Monique is the current queen bee of their school and is the girlfriend of The Bradley (Flynn Harne). Next in line for The Bradley is Jeanine, because she is the thinnest of all of the girls in school, and Renee is not happy. She wants The Bradley, and she has no problem with lying, cheating and dieting until she has him. Patty is starting to have second thoughts [amount what? ], and the ensuing antics are a bit unnerving and very humorous. Tatiana Nya Ford as Renee has to carry the show and set the pace. And she has no trouble doing so. Ford never holds back no matter what she has to or say or do as Renee. She is fast-talking, direct and extremely believable as a selfish, egotistical teen. Chara Bauer as Patty easily conveys Patty’s arc and becomes the perfect counterpoint to Renee’s over-the-top behavior. I was surprised when reading in her bio that she is new to acting. Emily Sucher plays Jeanine as a girl who isn’t the smartest and just wants to do what the popular kids want to do. She plays the part well. I have seen her in many Shakespeare productions, and Sucher is no dummy, and her explanation of the reason she won’t go to class — she doesn’t want to her brain to get fat by developing muscles from learning — is hysterical. Alice Stanley plays Jane and Mrs. Blue. We don’t see much of Stanley, but her two roles are diverse and are done well. Terrance Fleming plays a number of roles, and each time he is on stage, laughter is always guaranteed. The Bradley is played by Flynn Harne. Harne does a great job playing a boy who has no idea what is going on and who just wants to date someone who actually eats! The set by Scenic Designer Casey Dutt is a cross between an ‘50s ice cream parlor and a young girl’s pink dream bedroom. I love the black and white checked floor. Grey’s directorial choice for the ending of “Schoolgirl Figure” is, I feel, a great choice. I can’t give it away, but it left me feeling that there is a silver lining in every dark (albeit, entertaining) cloud. Advisory: Adult language and situations. Running Time: Approximately two hours with one 15-minute intermission. “Schoolgirl Figure” runs through December 4, 2016, at Cohesion Theatre Company. Click here for tickets and for more information.